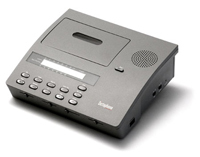 The Philips LFH 725 is a minicassette desktop dictation kit incorporating a hand-help microphone with 4-position switch for one-handed operation. A sensitivity switch lets you select the optimum recording level and an index tone lets you prioritise documents. A large LCD display shows all the information you need.